In no other Peckinpah film is this more explicit—or more necessary to recognize—than Cross of Iron. The movie is not at all interested in providing a coherent historical, or even geographical, account of the Wehrmacht’s retreat from Russia in 1943. From moment to moment in its battle scenes we cannot tell which side is winning or losing, or why; sometimes we cannot be sure which side is which. Warfare in Cross of Iron is less a matter of armies clashing than layers of phantasmagoria overlapping. At one point around midfilm we are given the distinct impression that the platoon commanded by the almost mythically indestructible Sgt. Steyner (James Coburn) has been reduced, by a sudden barrage, to a single man sitting among corpses that seem to have become part of the earth. Subsequently the platoon regroups from somewhere and goes on to fight in further actions. Finally, in a ferocious complex of confusion, bad timing, and doublecross, they are all but wiped out. Yet even here Peckinpah’s relentlessly surreal editing mixes memory faces of the deceased with the panting, tortured visages of the survivors, so that the living and the dead, too, become interchangeable. There is nothing easy about Peckinpah’s art, either the making of it or the watching of it. His scenes are tours-de-force of minutely calculated montage; the percussion of images and gestures in a dialogue scene among three radically dissimilar Wehrmacht officers (James Mason, David Warner, Maximilian Schell) is as tortuous and breathbating as the taut, terrifying, eerily beautiful sequence that precedes it—Steyner’s patron encircling and efficiently annihilating a Russian artillery squad in a foggy, predawn forest. Peckinpah’s sense of rhythm is so absolute that the most awesome detail of the massacre, the punctuation and (might as well say it) consummation of the scene, is the slowmotion action and sound of Steyner ejecting an empty ammo clip from his submachine gun and throwing it aside. 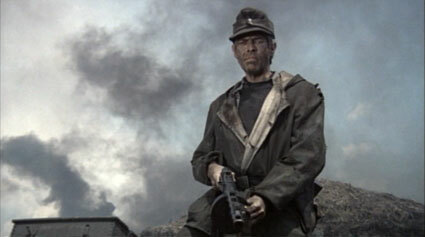 James Coburn as "the almost mythically indestructible Sgt. Steyner"
Cross of Iron is manifestly a deeply personal, almost private meditation on … not so much the world at war, but rather the world as war. I’m not sure how to feel about the often aphoristic script and the too-neatly emblematic characters, how necessary they may be to Peckinpah’s reach for abstraction. And while an anonymous (to most of us) German and Yugoslavian supporting cast contributes sympathetic presences to Steyner’s platoon, I can’t help regretting that Peckinpah didn’t smuggle Warren Oates, L.Q. Jones, Burt Young, Bo Hopkins, Harry Dean Stanton, et al., into the Wehrmacht and thus more decisively individuate this latest Wild Bunch. 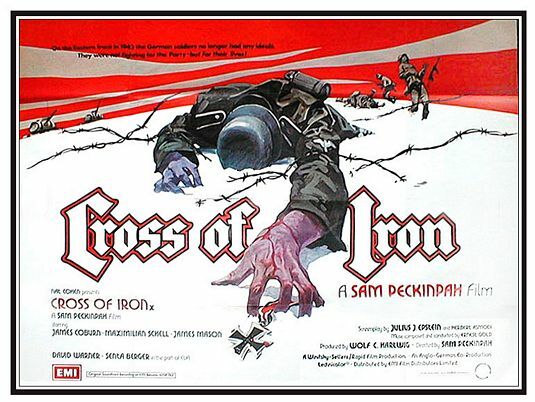 Indeed, how much of the abstractness of Cross of Iron was generated, or at least reinforced, by the circumstances of Peckinpah’s being cut off from his accustomed milieux, with reference to both setting and production conditions? (He was shooting this picture in Yugoslavia at the same time Robert Aldrich was making Twilight’s Last Gleaming in West Germany.) Yet Peckinpah was always violently estranged from Hollywood even when working geographically closer to the heart of the system, and more than one commentator has remarked the increasingly explicit parallel between this maverick filmmaker’s embattled position in the industry and the futile gestures of the protagonists of Pat Garrett & Billy the Kid (’73), Bring Me the Head of Alfredo Garcia (’74), and The Killer Elite (’75) against corrupt, self-perpetuating bureaucracies. Do not rejoice too much at his defeat.